Fluid Film has extended the life of the Central Coast Council fleet of lifeguard ATVs, by stopping rust and corrosion. The Central Coast is well-known for its picturesque coastline, with Central Coast Council tasked with providing lifeguard services for 15 beaches. To help their lifeguards get around the coastline, Central Coast Council has a fleet of all-terrain vehicles (ATVs) from Kubota. For many years the service team at Council have been battling corrosion issues, due to the ATVs having constant contact with salt water. Fleet Officer Major & Small Plant, David Bryant, said they had tried a range of products to try and stop the rust and corrosion and extend the life of the ATVs. “Our fleet of ATVs are in use almost continuously from September through to April every year,” David said. “At the end of each season each ATV would have significant rust and corrosion, despite the range of different products we had tried. Stott Industrial supplied the Council with samples of Fluid Film, in order to test it out on their ATVs. “To be honest, Fluid Film seemed too good to be true, however the proof became evident almost immediately,” David continued. At the start of the 2016/17 season, David and his team applied Fluid Film to every ATV. At each service the vehicles were inspected, with no rust found. “We’re using the same ATVs for a second season and we believe we’ll likely be able to use them for another two seasons as well,” David said. “In the past, every year we needed to trade in our fleet at the end of the season, with the vehicles almost on their last legs. The fact that we are now able to continue using our fleet is already saving us time and money. “We can’t believe we made it through an entire season without any mechanical breakdowns and are on our way to completing the second season. “We’ve now got the entire Small Plant team using Fluid Film in the workshop, which is making a great difference in our other equipment as well,” David concluded. Fluid Film’s water-repelling qualities inhibits any liquids and moisture from penetrating to recreational equipment, and with its long lasting lubrication, the tiniest of moving parts are far from rust formation and corrosion. Fluid Film works well in all weather and salt-water environments, providing the perfect solution for any recreational gears. This is why Fluid Film has been so successful for Central Coast Council on their ATVs. 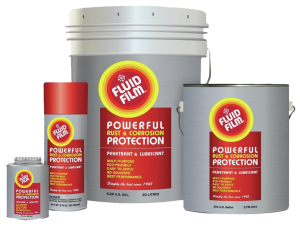 Fluid Film is a lubricant, penetrate and anti-corrosive, which has no solvents and is made on a lanolin base. It will not go sticky, gooey, tacky or gummy and offers a powerful corrosion protection for all metals and superior lubrication for all moving parts. It won’t dry out and will penetrate to the base of all metals, providing corrosion protection from both natural and industrial atmospheres. If you would like to try it for yourself, order your very own free sample today!